View More In Lug Nut Covers. Class up your big rig by installing these high quality Grand General 33mm lug nut covers. These will fit all the truck manufacturers -- Kenworth, Peterbilt, Mack, Volvo, International, Freightliner, Western Star, and everyone else. 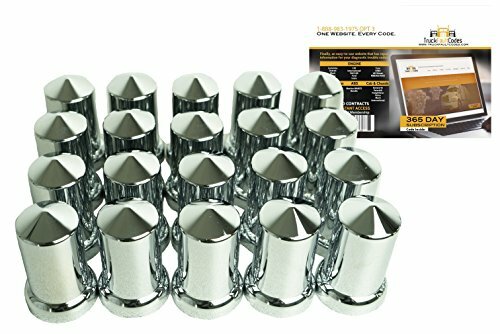 This listing is for a pack of 20 of this amazing looking chrome lug nut covers in Pointed style. This item also comes with a free 1 year membership to Truck Fault Codes, just log on and register. One website, every code. Finally an easy-to-use website that has repair information for your diagnostic trouble codes. Mobile friendly with any smart phone or tablet. If you have any questions about this product by Diesel Laptops, contact us by completing and submitting the form below. If you are looking for a specif part number, please include it with your message.